From the sixteenth century on, British involvement in Africa was reflected in an immense volume of writing. Inherent in this British literature—ranging from works of great literary merit to sheer trash—was a remarkable consistency in its inaccurate depiction of Africa and its people, mirrored in literary responses to the slave trade, the acquisition and subsequent loss of an empire, and the rise of independent Africa. But throughout four centuries, the literature centered upon one main theme: the confrontation between civilized Britain and savage Africa. Through a retrospecwww.tive analysis, The Myth of Africa demonstrates that the literary image of Africa is a fantasy of a continent and a people that never were and could never be. The Myth of Africa convincingly demonstrating how British representations have arisen more from Western fantasies than from material facts about African reality. Chapters on ten separate patterns of stereotypes (such as ‘The Dark Labyrinth’ and ‘The Strange Woman’) are followed by an extremely extensive and useful bibliography. Covering more than 400 years of both fiction and nonfiction, Hammond and Jablow find that British writings about Africa are informed by a consistent pattern of primitivist myths in which Africa and Africans emerge as the polar opposites of Britain and the British. It becomes clear that negative and denigrating stereotypes about Africa function to help the British to envision themselves positively as noble, honorable, and sophisticated. 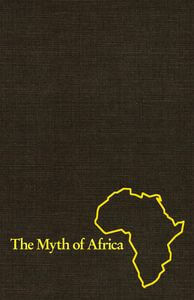 The Myth of Africa can be seen as an important founding text of postcolonial studies and discourse analysis. Hammond and Jablow envision British stereotypical representations as arising from projections of shared unconscious fantasies into the real world. The authors demonstrate how a body of myth about Africa developed into a tradition with a ‘vast storehouse of lurid images’ to which writers went again and again through the centuries to draw ‘material’ for their books.